C-O-L-O-R is foundation of proper French Country decorating. However, to create a uniquely country French space, you’ll need to incorporate hues within the “Provincial” palette. So what colors are uniquely french? Read on to learn about the perennial favorites. French blue is a “go-to” choice in French style. 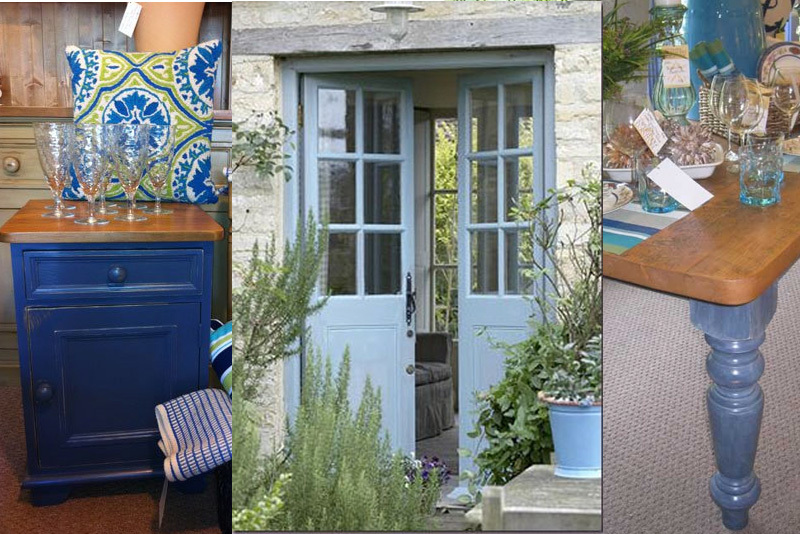 The tradition of adding blue to your home stems from Provence—where the color is found commonly on doors, in the garden plantings, and on ceramics—and readily incorporated in interiors. Shades of blue can range from a greyed-down blues to vibrant blues. Adding a touch of blue on an occasional table, rustic farm table base, pottery, or pillows creates the foundation for French style in your space. French blue can range from rich, royal blue to weathered grey blue to washed, distressed periwinkle. No other color creates warmth like yellow. In the French country decorating, the addition of mustard, turmeric or vivid yellow is just the bright element needed to envelop you in a French-inspired design. Whether it’s a wall painted a soft butter yellow, or the addition of a “pop” of color on a pillow or upholstery, yellow is a must. 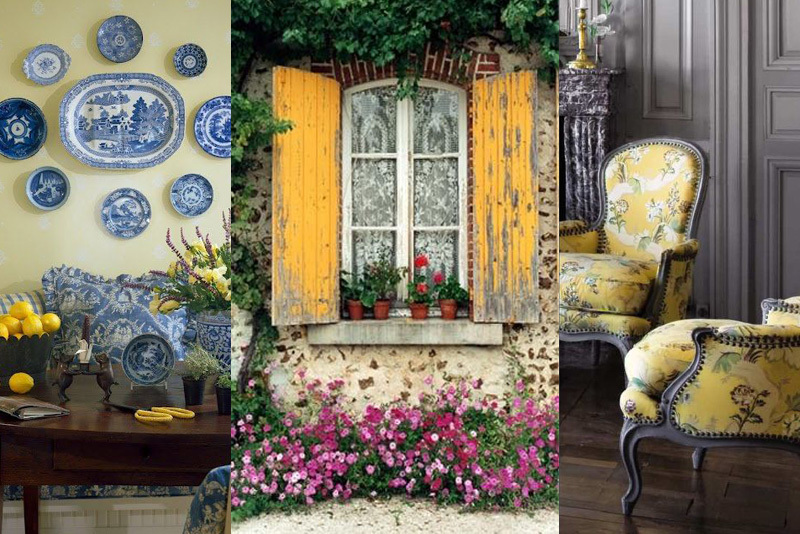 A pop of yellow adds vitality to your French country decor. Butter yellow walls, mustard furniture, or warm yellow upholstery adds distinctive French charm to the room. Red is the color of passion—and it embraces you when you create a French-inspired room. Red tones can span from richly saturated red, to soft and muted red with pink undertones. Favorite French country elements include the use of a barn red farm table with distressed red ladderback chairs, buffalo check upholstery, mixed with classic toile pillows. Many traditional French fabrics feature reds birds, urns and rural motifs. For a more updated feel incorporate larger scale prints mixed with woven casual linens, and red pinstripes. 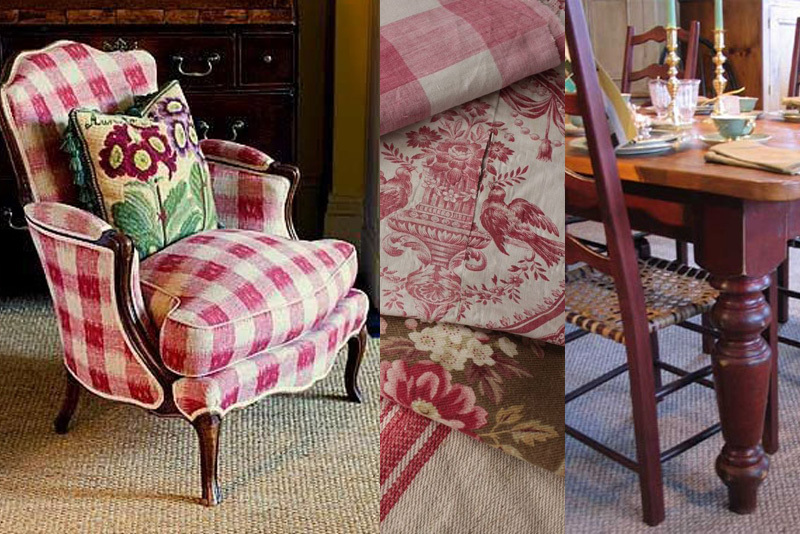 Reds add excitement to a French Country room with a mix of buffalo checks, toile and linens. Those fabrics paired with a barn red farmhouse table and chairs = French county perfection. Grey, taupe and shades of white are perhaps the most popular French country palette today. This rustic/elegance combination uses a mix of wood tones, linens and distressed furnishings to create a harmonious feel. The blend of stone, wood, paint and fabric is ideal when designing over a period of years. An antique window mirror over a distressed sideboard holding beautiful French lamps creates a collected feel. 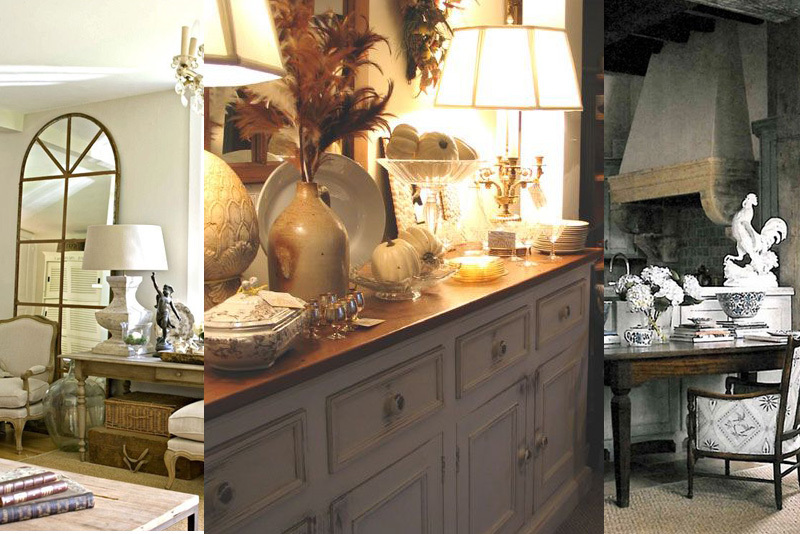 If you stay within “earthy” palette creating french country style can be relaxed and simple. A French Country home is created over years of collecting things you love. Selecting items with various wood tones, adding texture through fabrics, woven baskets, pottery and plaster lamps—creates a relaxed French country elegance.